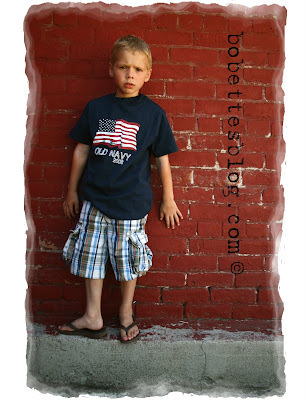 Bobettes Blog: Happy Fourth of July! I am just doing ONE PICTURE tonight! I just got home from Girls Camp and I am TIRED! So I hope all two of you who read my blog will like this picture. I have lots more I want to share but I will later. I am still alive and I still have Youth Conference on July 31. Happy Fourth of July and happy birthday Carter! I love the red brick wall. Thank you for remembering Carter's birthday you're the best. I love the Young Women!